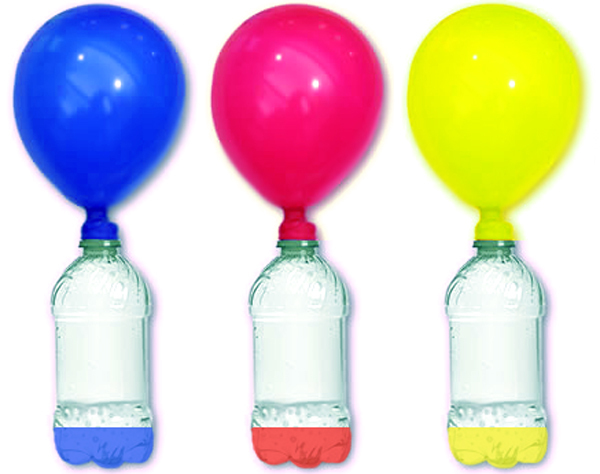 Demonstrate the states of matter by building a fizz inflator. This a a fun experiment for a unit on states of matter. You combine vinegar (liquid) and baking soda (solid) to create a gas (carbon dioxide), which blows up the balloon. Before the experiment, have students make a prediction and write a hypothesis. After the experiment, have kids draw and label the parts of the fizz inflator (solid, liquid, gas) in their science notebook. Visit Science Bob to see basic fizz inflator instructions. Edhsw.com created colored fizz inflators for their "miXscope movie of the week." Click here to check out their miXscope movie! They added food coloring to their vinegar. Then, they varied the amounts of baking soda in each bottle.